Is that one of those fundamental questions like–The Beatles or The Rolling Stones; chocolate or vanilla; Letterman or Leno; paper or plastic? Last week, a friend of mine sent me an article published by Slate—“Who I Follow on Twitter and Why.” It was kind of a light-bulb moment. We seem to lump Twitter and Facebook into the same bucket, “You on Facebook and Twitter?” But they are really so radically different. I love discussing this stuff, because we are right in the thick of such a pervasive transformation in communication. We have no concept how this moment in time we are living right now will impact our behavior, relationships, culture, and lives in the next few years–and for the rest of eternity. Not that Twitter will stand the test of time or be around in the year 2100, but who knows what communication will look like then? Getting back to the here and now, I really do think there are “Twitter people” and “Facebook people.” I deal in both professionally–and more and more, Linked In. But they all render fiercely different experiences and visitor payoffs. 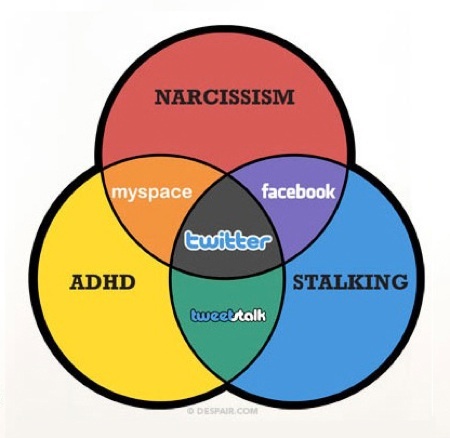 As I was exploring this “Twitter person” concept, I found this Venn diagram from BoingBoing. It provides another way to slice and understand social-media behavior. I guess the increasing interest in Twitter is understandable–as sort of the nexus of it all. I read somewhere that Facebook is like playing in your fenced-in backyard. Twitter is like playing in the street. You are much more exposed, yet the asynchronous format is much more impersonal. Following is actually much less social than friending. Except for the way Mark Zuckerberg can mine our clicks and our navigation paths, I don’t buy the security complaints on Facebook. A user can manage access. You can protect everything you post with your settings dashboard. My son Elliot is a very good example. His profile is so well hidden, the way can see it is when he accidentally leaves it up on his computer. LOL. That’s security, huh? Are you a Twitter person or a Facebook person? And why? Let me know . . .
Great topic. I confess I vastly prefer Facebook, but as a writer I feel that Twitter has more potential as a resource tool. I am still a newbie to it, and also find its glitches frustrating. Still hard for me to know whether something is not working because of my incompetence or Twitter’s glitches…lists that I have tried repeatedly to delete that still appear, and duplicate lists, etc. Lindsey — Thanks for your comment. Yes, I think both platforms are somewhat “glitchy” in their own ways. Twitter Has been morphing recently — so may be more challenging. The cryptic nature of Twitter is both challenging and irritating to me as a writer — but I guess that’s part of its appeal. Are you trying to delete lists you’ve made — or delete yourself from lists you are on? I have stopped using Facebook and am now using Twitter. I have been wrting jokes for the past year and it is a good place to try them out, and I like the challenge of keeping them short. I’m not sure how to get more followers who are looking for the kind of material I am posting. I am getting more of them, but it is a slow process. I stopped looking at Facebook because I am just bored with using my computer that much. I rarely check my email anymore either. I use Twitter with my phone. Richard — thanks for chiming in. Love the idea of a trying out jokes on Twitter. I was just talking about the impact of SmartPhones on Twitter adoption this morning! Enjoy the Tweet Life! I”ve noticed that I am drawn to twitter because it is more open and I am able to make connections with people in my industry who are not in my facebook circles. Also I like twitter because I conncect with more people with my shared interests, personal and professional. But facebook is stil important to me because I am able to market my OTHER business which is a local photography business.